Modifications of the ovipositor appear to have played a prominent role in defining the host range of parasitoid hymenopterans, highlighting an important contributing factor in shaping their oviposition strategies, life histories and diversification. Despite many comparative studies on the structure of the hymenopteran terebra, little is known about functional aspects of the musculoskeletal ovipositor system. Therefore, we examined all inherent cuticular elements and muscles of the ovipositor of the ichneumonid wasp Venturia canescens (Gravenhorst, 1829), investigated the mechanics of the ovipositor system and determined its mode of function. We found that the movements of the ichneumonid ovipositor, which consists of the female T9 (9th abdominal tergum), two pairs of valvifers and three pairs of valvulae, are actuated by a set of six paired muscles. The posterior and the anterior 2nd valvifer-2nd valvula muscles flex and extend the terebra from its resting towards an active probing position and back. The dorsal T9-2nd valvifer muscle is modified in V. canescens and forms distinct bundles that, together with the antagonistically acting ventral T9-2nd valvifer muscle, change the relative position of the 2nd valvifer to the female T9. Thereby, they indirectly tilt the 1st valvifer because it is linked with both of them via intervalvifer and tergo-valvifer articulation, respectively. The 1st valvifer acts as a lever arm that transfers movements to the 1st valvula. The posterior T9-2nd valvifer muscle and the small 1st-valvifer-genital membrane muscle stabilize the system during oviposition. From our examination of the elements of the musculoskeletal ovipositor system of ichneumonids, we discussed leverages and muscle forces and developed a functional model of the underlying working mechanisms adding to our understanding of a key feature that has largely determined the evolutionary success of the megadiverse Ichneumonidae with more than 24,000 hitherto described species. The vast majority of hymenopterans are parasitoids of other insects. Apart from oviposition, their ovipositor serves several tasks in the parasitoid lifestyle, i.e. navigating or penetrating the substrate (if the host is concealed) or the targeted egg/puparium, assessing the host, discriminating between suitable and previously parasitized hosts, piercing the host, injecting venom, oviciding the competitors’ eggs and finding a suitable place for egg laying . In some species, the ovipositor is also used to form a feeding tube for host feeding or defensive stinging . Undoubtedly, modifications of the ovipositor apparatus have been one of the key factors in the evolution of the parasitoids’ oviposition strategies, the life histories and the enormous diversification of this large and ecologically important insect order [2–4]. The hymenopteran ovipositor consists of the female T9 (9th abdominal tergum), two pairs of valvifers and three pairs of valvulae (cf. Figs. 1a, c, 5a) derived from the 8th and 9th abdominal segments (7th and 8th metasomal segments) (morphological terms are applied according to the Hymenoptera Anatomy Ontology (HAO) [5–7]; a table of the terms used, their definitions and synonyms is given in Table 2 in the Appendix). The basally situated valvifers accommodate the operating musculature, whereas all the valvulae are devoid of intrinsic musculature [8–10]. The 1st valvifers (fusion of the 8th gonocoxites with the gonangula ; = gonangulum, gonangula sensu ) anterordorsally are continuous with the rami of the 1st valvulae (8th gonapophyses; = lower valves sensu ). Their posterior angles articulate dorsally with the female T9 via the tergo-valvifer articulation and ventrally with the 2nd valvifers via the intervalvifer articulation. The 2nd valvifers (9th gonocoxites) extend in the form of the 3rd valvulae (9th gonostyli; = ovipositor sheaths sensu ) and are anteroventrally articulated with the 2nd valvula (fusion of the 9th gonapophyses; = upper valve sensu ) [8, 9], which is secondarily re-separated except at the apex in some parasitoid taxa . The interlocked 1st and 2nd valvulae enclose the egg canal and form the terebra (= ovipositor (shaft) sensu ), which is embraced by the 3rd valvulae when not in use. The ventral surface of the 2nd valvula is interlocked with both of the 1st valvulae by a sublateral longitudinal tongue called the rhachis, which runs within a corresponding groove called the aulax along the dorsal surface of each of the 1st valvulae. This so-called olistheter system allows the three parts of the terebra to slide longitudinally relative to each other [9, 11]. The sensillar equipment of the 1st and 2nd valvulae is highly variable among parasitoid hymenopterans . Despite many descriptive studies on the comparative morphology of the hymenopteran terebra [8, 9, 11, 12], the mode of function of the musculoskeletal ovipositor system has only been described in some “symphytan” families [10, 13–15], in the aculeate Apis mellifera Linnaeus, 1758 (Apidae)  and Cryptocheilus versicolor (Scopoli, 1763) (Pompilidae) , in some species of Cynipoidea [17, 18], and in a few parasitoid species of Ceraphronoidea  and Chalcidoidea [20–27]. 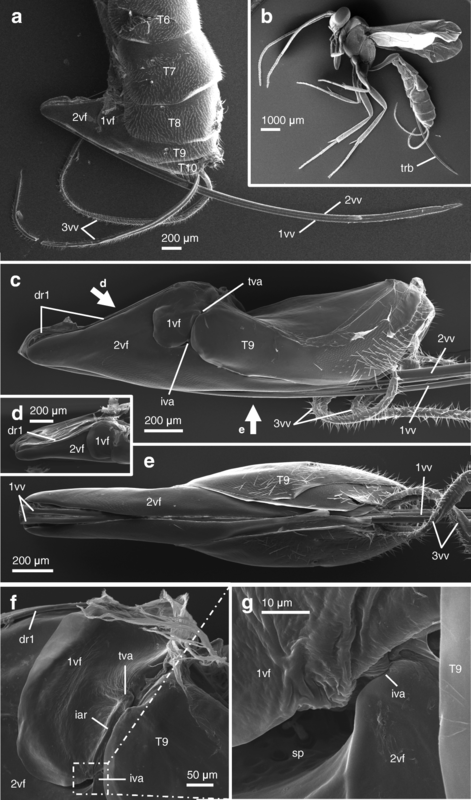 However, the underlying working mechanisms of the musculoskeletal ovipositor system of the extremely diverse and species-rich superfamily of Ichneumonoidea has remained largely unexplored so far and little is known about the actuation of the various ovipositor movements that are executed during oviposition. In this study, we investigated structural, mechanical and functional aspects of the ovipositor of Venturia canescens (Gravenhorst, 1829) (Hymenoptera: Ichneumonidae: Campopleginae), a cosmopolitan, synovigenic , non-host feeding , solitary, koinobiont larval endoparasitoid of several moth species (Lepidoptera) [30, 31]. The oviposition behaviour (Additional file 1) is described by Rogers . These parasitoid wasps coat their eggs with virus-like particles (VLPs) to circumvent their host’s immune system [33–37] and exhibit both arrhenotokous and obligate thelytokous reproduction modes [38–41]. We aimed to (1) describe the ovipositor of V. canescens, including all inherent cuticular elements and muscles, (2) examine the mechanics of this musculoskeletal system, (3) determine its mode of function and (4) discuss the process of oviposition. We combined light microscopy (LM), scanning electron microscopy (SEM), synchrotron X-ray phase-contrast microtomography (SR-μCT) and subsequent 3D image processing with muscle and leverage analyses. Based on these microscopical and microtomographical studies, we present a thorough morphological, mechanical and functional analysis of the musculoskeletal ovipositor system (Additional file 2) that steers the various movements executed by the female ichneumonid wasp during oviposition. The paired 1st valvulae (1vv, Figs. 1a, c, e, 2a, b, e, f, g, 4d) of V. canescens are terminally differentiated in five apically directed sawteeth (st; Fig. 2b) of decreasing size that are used to penetrate the substrate and the host’s skin [42, 43]. Each of the 1st valvulae has a medioventral part formed into a thickened longitudinal flap that projects inwards into the egg canal (lf1; Fig. 3a; = medio-ventral seal sensu ). These thin chitinuous flaps are considered to effectively seal the crack between the 1st valvulae and prevent the loss of venom and/or oviposition fluid during oviposition [11, 44–46]. The pressure of the venom squeezes the two membranes together and thus closes the seal. A transverse flap called the valvillus (vlv; Fig. 2e) protrudes from their medial walls and projects into the central egg/venom canal (cf. ). Segregate valvilli are typical for taxa of Ichneumonoidea but vary in shape and number between subfamilies [11, 46]. In non-aculeate Hymenoptera, they potentially serve as a stop and release mechanism for the egg by maintaining the egg in position within the terebra and blocking the egg canal [32, 43, 46] or by pushing fluids into the ovipositor, thereby creating a hydrostatic pressure that forces the egg out of the terminal portion of the egg canal . The internal microsculpture of the medial walls of the egg canal consists of distally oriented scale-like structures; leaf-like ctenidia (ct; Fig. 2f) occur from the proximal basis of the valvulae to the further distally positioned region of the valvillus, where they are replaced by spine-like subctenidial setae (scts; Fig. 2g). The ctenidia help to push the deformable egg along the egg canal by alternate movements of the 1st valvulae and prevent it from moving backwards [43, 46, 47]. They are also hypothesized to deliver forward a liquid lubricant for the moving valvulae and thus reduce friction between the valvulae during oviposition [42, 45, 46, 48]. The 2nd valvula (2vv; Figs. 1a, c, 2a, b, c, d, 4d) is bulbous at its proximal end and basally articulated with the 2nd valvifers via the basal articulation (ba; Fig. 4i; blue region in Fig. 3). There are openings on each of the dorsolateral sides of the bulbs that presumably enable the passage of eggs, venom and other fluids. The dorsal ramus of the 2nd valvula extends along its dorsal margin and bears the processus articularis (pra; Fig. 5h) laterally at its proximal part (anterior) and the processus musculares (prm; Fig. 5h) dorsally. On its ventral side, the 2nd valvula bears the rhachises (rh; Fig. 2b, c, d), which are interlocked with both the aulaces (au; Fig. 2e, f, g) on the dorsal side of the opposing paired 1st valvulae via the olistheter system (oth; Fig. 4h2), which extends all the way to the apex. The 2nd valvula of V. canescens and other ichneumonids (e.g. taxa belonging to the subfamilies of Campopleginae, Cremastinae, Ctenopelmatinae, Neorhacodinae and Tryphoninae) consists of two halves that are joined together for the most of their length by a dorsal notal membrane (nm; Fig. 3a; cf. [32, 45]) but are fused at the apex , so that the 2nd valvula possesses a lumen that is undivided at the apex of the terebra (arrows in red region of Fig. 3b) but that splits into two lumina for a substantial proportion of its proximal part. The blunt tip of the 2nd valvula dorsally possesses a distal notch (no; Fig. 2a, c), which is assumed to be associated with moderating penetration of the host cuticle  or to maintain a grip on the inner surface of the host cuticle and thereby providing a momentary clasping mechanism in the host’s skin to ensure continuous engagement with the host during oviposition . Almost all ichneumonid species with a pre-apical notch are larval endoparasitoids of holometabolous insects . At their external surface, both the 1st and the 2nd valvulae of V. canescens exhibit canpaniform sensilla (cs; Fig. 2b), which are concentrated at the apices of the valvulae, especially distally of the distal notch of the 2nd valvula and posteriorly of the sawteeth of the 1st valvulae (cf. ). However, the sensillar equipment of the terebra was not further investigated in this study (but see ). The terebra (trb; Fig. 1b, 3) consists of the paired 1st valvulae and the 2nd valvula, which are tightly interlocked by the olistheter (oth; Fig. 4h2). The distally directed scales/serrations on the surfaces of both the rhachises and the walls of the aulaces (sc; Fig. 2d, f, g) potentially reduce friction forces by minimizing the contact area of the olistheter elements . However, we hypothesize that these scales might also serve other functions: (1) they, analogous to the ctenidia, might forward a liquid lubricant from the metasoma to the apex of the olistheter system to reduce friction between the moving valvulae (cf. ), and/or (2) they might create anisotropic conditions in the olistheter by increasing frictional forces whenever a valvula is pushed in proximal direction, thereby preventing the 1st valvulae from randomly sliding back during piercing/drilling. The terebra extends far beyond the tip of the metasoma. The diameter of the terebra decreases from the proximal to its distal end, although the part in between remains similar in diameter throughout. The cross sections of both the 1st and the 2nd valvulae are notably different across the length of the terebra (Fig. 3b). The egg canal is largely defined by the 1st valvulae but its dorsal side is formed by the 2nd valvula (ec; Fig. 3a). At the apex of the terebra, the 1st valvulae are enlarged and form an approximately spindle-shaped cavity (ssc; red region in Fig. 3) that is partly occluded by the valvilli of each of the 1st valvulae (cf. ). The paired 3rd valvulae (3vv; Figs. 1a, c, e, 3) emerge at the posterior end of the 2nd valvifer and ensheath and protect the terebra when at rest. The lateral walls of the 3rd valvulae of V. canescens and other parasitoid wasps with long external terebrae are annulated by fine transversal narrow furrows (cf. ), which makes them flexible and allow their extensive deformation during oviposition. Since the valvulae lack intrinsic muscles, deformation must arise as a passive response to external pressures. The ability to bend the 3rd valvulae facilitates oviposition , however, it is not yet clear if V. canescens is able to support the flexion of the terebra towards an active probing position and its steering during the search for a potential host with their 3rd valvulae or if they simply follow the movements of the terebra (Fig. 5n; Additional file 1; cf. ). The distally directed dense microsetae on the inner surface of the 3rd valvulae (cf. ) are thought to be involved in cleaning the ovipositor sensilla between oviposition episodes [2, 12, 50]. The 3rd valvulae potentially also have a sensory function . The paired 1st valvifers (1vf; Figs. 1a, c, d, f, g, 4b, d, j) of V. canescens and other ichneumonid species are short and show an almost oblong shape (with rounded edges) , unlike the bow-shaped 1st valvifers of species of Chalcidoidea [21, 23–26] or the triangularly shaped 1st valvifers of species of Apoidea [8, 9, 51, 52]. The posterior angles of the 1st valvifer are doubly movably articulated with the modified female T9 via the tergo-valvifer articulation and via its posteroventral corner with the 2nd valfiver by means of the intervalvifer articulation (tva/iva; Figs. 1c, f, g, 4f, j). A strengthened ridge called the interarticular ridge (iar; Figs. 1f, 4f) occurs between the two articulations and might mechanically stabilize the 1st valvifer during oviposition. The anterodorsal angle of the 1st valvifer is continuous with the dorsal ramus of the 1st valvula (dr1; Figs. 1c, d, f, 4h1, i, j), which is interlocked with the dorsal projection of the 2nd valvifer (dp2; Fig. 4e, h1) by a system analogous to the olistheter. This tight interlocking guides the dorsal rami and prevents them from buckling when pushing forces are applied during the protraction of the 1st valvulae. The rami make acute angles around the proximal bulbous end of the 2nd valvula. The cuticle in the part of the dorsal rami that slides around the angle during pro- or retraction of the 1st valvulae needs to be flexible in the sagittal plane and might contain high proportions of the very elastic rubber-like protein resilin (cf. [53–55]). The paired 2nd valvifers (2vf; Fig. 1a, c, e, f, g, 4b, d) are elongated and their posterior parts are placed medially of the female T9. A conjunctiva, called the genital membrane (not shown), connects the ventral margins of both the 2nd valvifers arching above the 2nd valvula. The 2nd valvifer bears the dorsal flange, which extends upon its dorsal margin and which is divided by a sharply defined ridge called the basal line (bl; Fig. 4e) into an anterior and a posterior section. The anterior section of the dorsal flange of the 2nd valvifer (asdf; Fig. 4e) dorsally bears the dorsal projection of the 2nd valvifer (dp2; Fig. 4e, h1) and extends upwards in a hook-shaped lobe (hsl; Fig. 4e; sensu ) at its posterodorsal end, which might allow a greater arc of movement of the 1st valvifer and therefore a greater protraction of the 1st valvulae. The dorsal margins and the dorsal flanges are strengthened by cuticular ridges that might have a stabilizing function to prevent deformation. Sensillar patches (sp; Fig. 1g) can be seen on the 2nd valvifer near the intervalvifer and the basal articulation (cf. ), monitoring the movements of the 1st vlavifer and therefore the connected 1st valvula or the position of the bulbs of the 2nd valvula. The posterior section of the dorsal flange of the 2nd valvifer (psdf; Fig. 4e) is elongated and oriented almost vertically. At their posterodorsal ends, the 2nd valvifers are connected by the median bridge (mb2; Fig. 4e). The duct of the venom gland reservoir (vd; Fig. 5h) is situated in between the paired 2nd valvifers. The female T9 (T9; Figs. 1a, c, e, f, g, 4b, d) is elongated and anterodorsally bears a hook-shaped structure. Medially at its anterior end, the T9 forms a funnel-like structure at the cordate apodeme (ca; Fig. 4e, f, g), situated posteriorly to the tergo-valvifer articulation. This structure has not yet been described in parasitoid hymenopterans. The anterodorsal and dorsal margins of the female T9 is strengthened by the anterior flange of T9 (af9; Fig. 4e) that might mechanically stabilize the female T9 during oviposition. The musculoskeletal ovipositor system possesses three main joints. The basal articulation (ba; Fig. 4i) connects the laterally placed bulbs of the 2nd valvula with the thickened anteroventral parts of the 2nd valvifers via a rotational joint. This joint might also allow some limited pivoting movements of the 2nd valvula and therefore of the whole terebra. Both the 2nd valvifer and the female T9 are connected with the 1st valvifer by the intervalvifer articulation and the tergo-valvifer articulation (iva/tva; Figs. 1c, f, g, 4f, j), respectively, forming a double joint. The tergo-valvifer articulation is situated dorsal to the intervalvifer articulation. Both of these articulations act as rotational joints; thus, the 1st valvifer is movable in the sagittal plane only. However, there are, to the best of our knowledge, no studies hitherto that measured tensions of abdominal muscles of hymenopterans we could refer to. The ovipositor of V. canescens possesses a set of six paired muscles (Fig. 4c; Table 1), one of them (m4) forming two distinct bundles. The paired 1st valvifer-genital membrane muscles (m1) are the only muscles of the 1st valvifer. They originate at the medial surface of the posteroventral part of the 1st valvifer, i.e. between the tergo-valvifer and the intervalvifer articulation, and insert anteriorly on the genital membrane. They are the smallest muscles of the ovipositor with a CSA of 0.0008 mm2 each (Table 1). The paired fan-shaped anterior 2nd valvifer-2nd valvula muscles (m2) arise at the medial region along the anterodorsal part of the 2nd valvifer, largely at the anterior section of the dorsal flange (asdf; Fig. 4e), and insert at the processus articularis (pra; Fig. 5h), a process that extends laterally from the proximal part of the 2nd valvula to form the medial part of the basal articulation. These muscles have a CSA of 0.0032 mm2 each (Table 1). The paired posterior 2nd valvifer-2nd valvula muscles (m3) originate at the medial region along the ventral part of the 2nd valvifer and insert at the processus musculares (prm; Fig. 5h), namely the apodeme that extends dorsally from the proximal part of the 2nd valvula to the genital membrane. These muscles have a CSA of 0.0039 mm2, which is similar to that of m2 (Table 1). 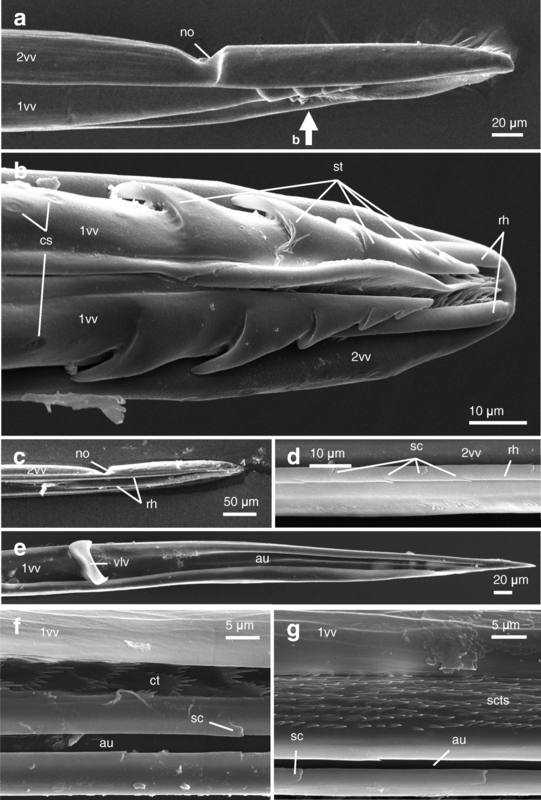 The paired dorsal T9-2nd valvifer muscles (m4a/b) are modified in their insertion and form two distinct muscle bundles, as it is also known to occur in the ichneumonid genus Megarhyssa Ashmead, 1858 [8, 60]. One part of these muscles (m4a) arises at the lateral region along the posterodorsal part of the anterior margin of female T9 and inserts at the anterior section of the dorsal flange of the 2nd valvifer (asdf; Fig. 4e) and partly on the hook-shaped lobe of the 2nd valvifer (hsl; Fig. 4e). The other part (m4b) is fan-shaped and originates at the medial region along the posterodorsal part of the anterior margin of female T9. The muscle tendons (tm4b; Fig. 4f, g) also insert at the anterior section of the dorsal flange of the 2nd valvifer, ventrally to the insertion region of m4a. The tendon of m4b thereby traverses the funnel-like structure at the cordate apodeme (ca; Fig. 4f, g) of the female T9. Muscles m4a and m4b are long thick muscles with a CSA of 0.0050 mm2 and 0.0039 mm2, respectively (Table 1). 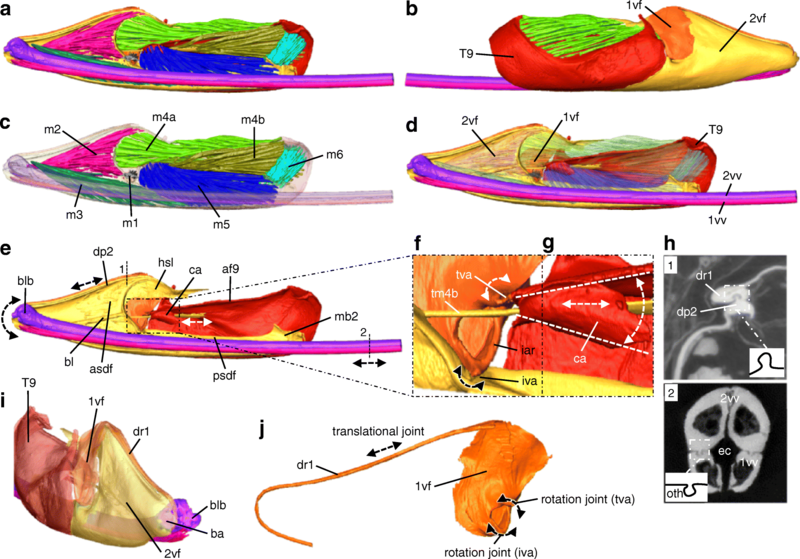 The paired ventral T9-2nd valvifer muscles (m5) arise from the medial region of the anterodorsal part of the female T9, partly at the funnel-like structure at the cordate apodeme (ca; Fig. 4f, g), and insert along the posterior section of the dorsal flange of the 2nd valvifer (psdf; Fig. 4e). These are the largest ovipositor muscles with a CSA of 0.0077 mm2. The paired posterior T9-2nd valvifer muscles (m6) arise medially at the posterodorsal part of the female T9 and insert at the median bridge of the 2nd valvifers (mb2; Fig. 4e). They are the second smallest muscles of the ovipositor with a CSA of 0.0015 mm2 (Table 1). The literature concerning the musculoskeletal ovipositor system of ichneumonoid wasps is limited and some inconsistent statements have been made about certain ovipositor muscles. We describe the 1st valvifer-genital membrane muscle for the first time in an ichneumonoid species. Either this small muscle is not present in all ichneumonoid species or, more likely, previous authors (e.g. [8, 60]) might have overlooked its presence. In Megarhyssa macrurus lunator (Fabricius, 1781) (Hymenoptera: Ichneumonidae), Abbott  described the 1st valvifer-2nd valvifer muscle as ‘a small muscle connecting the “runner” plate [= 2nd valvifer] with the dorsal margin of the “kidney” plate [= 1st valvifer]’. However, this muscle has neither been found in Megarhyssa atrata (Fabricius, 1781) (Hymenoptera: Ichneumonidae) by Snodgrass  nor in V. canescens in the present study and might have been mistaken for the anterior 2nd valvifer-2nd valvula (m2) muscle by this author. In general, the musculoskeletal ovipositor system of ichneumonoid wasps is similar to that of the parasitoid hymenopteran species belonging to Ceraphronoidea , a superfamily that is closely related to Ichneumonoidea . However, the ceraphronoids lack the anterior 2nd valvifer-2nd valvula muscle  that is present in V. canescens and other ichneumonids. All chalcidoid species investigated to date with regard to the ovipositor muscles (Agaonidae , Aphelinidae , Chalcididae , Eurytomidae , Pteromalidae [21, 25] and Torymidae ) comprise the same set of muscles as ichneumonids but lack the 1st valvifer-genital membrane muscle. All the taxa of Chalcidoidea, Ceraphronoidea and Ichneumonoidea investigated hitherto (including our study of V. canescens) lack the 1st valvifer-2nd valvifer muscle, lateral T9-2nd valvifer muscle, 2nd valvifer-genital membrane muscle and T9-genital membrane muscle, which have been described in other hymenopteran taxa . The set of six paired ovipositor muscles in V. canescens (Fig. 4c; Table 1) comprises two pairs of two antagonistically working muscles that are mainly responsible for the various ovipositor movements, and two muscles stabilizing the musculoskeletal system. Based on the following functional model, we assume that the anterior (m2) and the antagonistically acting posterior 2nd valvifer-2nd valvula muscles (m3) extend or flex the terebra, whereas the two parts of the dorsal T9-2nd valvifer (m4a/b) and the antagonistically acting ventral T9-2nd valvifer muscle (m5) indirectly protract or retract the 1st valvulae. The relatively small 1st valvifer-genital membrane muscle (m1) and the posterior T9-2nd valvifer muscle (m6) might predominantly serve for the stabilization of the ovipositor system during oviposition. The 2nd valvula of V. canescens is connected with the 2nd valvifers by a rotational joint called the basal articulation (ba; Figs. 4i, 5h, i, l, m). Two antagonistic muscles (m2, m3) insert at the bulbous region around this articulation (Fig. 5h). The insertion region of the posterior 2nd valvifer-2nd valvula muscle (m3) at the 2nd valvula is located dorsally of the basal articulation, whereas its region of origin at the 2nd valvifer is located posteroventrally to it. Therefore, a contraction of m3 (F3; Fig. 5g, i) causes the bulbs (blb; Fig. 4e, i) to pivot anteriorly at the basal articulation. This leads to a flexion of the 2nd valvula and the interlocked 1st valvulae from its resting position between the paired 3rd valvulae towards an active probing position (small number 2; Fig. 5g, i; Table 1). An alternate contraction of m3 on either side might also cause the terebra to rotate to a certain degree. The insertion region of the anterior 2nd valvifer-2nd valvula muscle (m2) at the 2nd valvula is situated posteroventrally of both the basal articulation and the insertion region of m3, whereas its origin at the 2nd valvifer is located posterodorsally of the articulation. Hence, when m2 (F2; Fig. 5g, i) contracts, the terebra is extended towards its resting position (small number 1; Fig. 5g, i; Table 1). However, the lengths of the effective (= mechanical) inlever arms (a’ and b’; Fig. 5m) vary greatly with attachment angle (joint angle), i.e. during the flexion or extension of the terebra. The attachment angle of m3 in the resting position is almost 90°; thus, the effective inlever arm is almost optimal, so that the force of m3 can be optimally transmitted to the 2nd valvula, which leads to a high torque. By contrast, the attachment angle of m2 in the resting position is far below 90° but increases when the wasp flexes its terebra towards the active probing position. This results in an increase in length of the effective inlever arm, an optimal force transmission of m2 at the basal articulation and consequently a high torque. 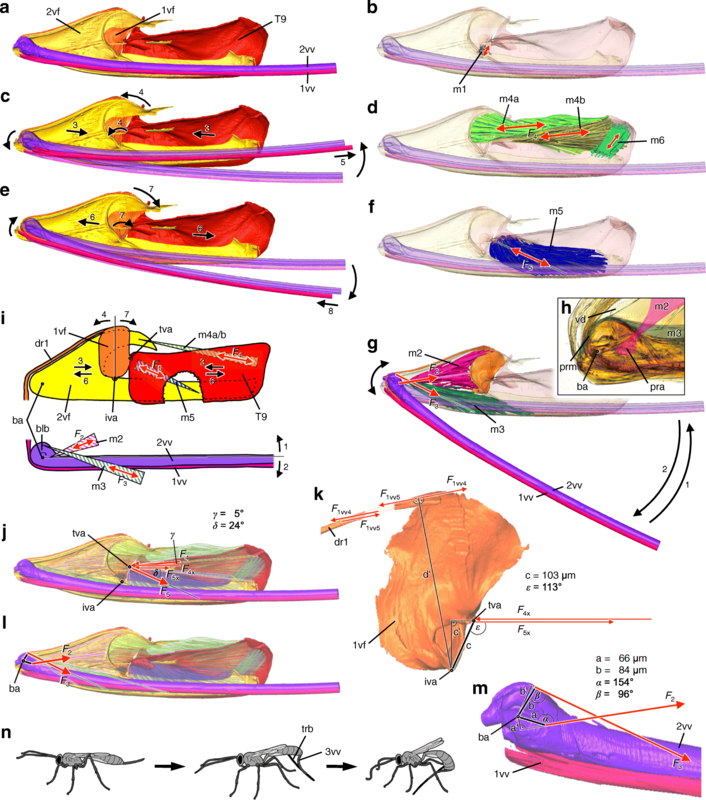 High torques at the basal articulation might be crucial to enable the extensive movements for both the flexion and extension of the terebra, despite the relatively small anatomical inlevers. Three muscles (m4–m6) connect the 2nd valvifer with the female T9, both these structures being connected with the 1st valvifer by the intervalvifer articulation or the tergo-valvifer articulation (iva/tva; 1c, f, g, 4f, j, 5i–k), forming a double joint. The insertion regions at the 2nd valvifer of both parts of the dorsal T9-2nd valvifer muscle (m4a/b) lie anterodorsally, whereas the regions of origin at the female T9 are posterodorsally located of both articulations. A contraction of m4a and m4b (F4; Fig. 5d, i) moves the 2nd valvifer posteriorly and the female T9 anteriorly towards each other (small number 3; Fig. 5c, i), whereby the tension of the posterior T9-2nd valvifer muscle (m6) presumably prevents the involved cuticular elements to rotate around the articulations. This movement causes the 1st valvifer to tilt anteriorly (small number 4; Fig. 5c, i) because it is articulated with both the 2nd valvifer and the female T9 via rotational joints (intervalvifer and tergo-valvifer articulation). The 1st valvifer acts as a one-armed class 3 lever that transfers its tilting movement to the dorsal ramus of the 1st valvula, causing the 1st valvula to slide distally relative to the 2nd valvula (small number 5; Fig. 5c). Both m4a and m4b act as protractors of the 1st valvulae (Table 1). They might also assist in extending the terebra (Fig. 5c), as a simultaneous protraction of the 1st valvulae places the terebra under unilateral tension due to friction between the olistheter elements of the 1st and 2nd valvulae. The origin of the antagonistic ventral T9-2nd valvifer muscle (m5) at the female T9 is situated posterodorsally near the intervalvifer articulation and posterior to the tergo-valvifer articulation, whereas its insertion region at the 2nd valvifer is located posteroventrally of both these articulations. Its contraction (F5; Fig. 5f, i) moves the 2nd valvifer anteriorly with respect to the female T9 (small number 6; Fig. 5e, i), thus indirectly causing the 1st valvifer to tilt posteriorly (small number 7; Fig. 5e, i) and the 1st valvulae, as a direct consequence, to slide proximally relative to the 2nd valvula (small number 8; Fig. 5e). Therefore, m5 acts as a retractor of the 1st valvulae (Table 1). It might also assist in flexing the terebra (Fig. 5e), as a simultaneous retraction of both of the 1st valvulae places the terebra under a unilateral tension due to friction between the olistheter elements of the 1st and 2nd valvulae. Muscles m4a and m4b act antagonistically against m5, i.e. m4a/b protract the 1st valvulae, whereas m5 retracts them. The posterior T9-2nd valvifer muscle (m6) stabilizes the ovipositor system by holding the 2nd valvifer and the female T9 in position and prevents them to rotate around the articulations (Fig. 5d; Table 1), although some limited movements in dorso–ventral direction at their posterior ends are likely to occur (cf. Fig. 4g). The distance that the 1st valvifer moves is equally transferred to the 1st valvula. Thereby, the shape of the 1st valvifer and the positions of the tergo-valvifer and the intervalvifer articulations influence the way how the 1st valvula is moved, i.e. the more closely the two articulations are situated to each other and the further they are away from the anterior angle of the 1st valvifer, the further the 1st valvula will slide relative to the 2nd valvula along the olistheter . An increase of the quotient of the effective outlever to the effective inlever (d’: c’ ratio) results in a smaller force output but an increase in the potential maximum velocity and mechanical deflection, i.e. an increase in the speed and the movement distance of the dorsal rami of the 1st valvulae. Their tight interlocking with the dorsal projection of the 2nd valvifer prevents them from buckling and transfers the movements to the apex of the valvulae. The double joint system of the 1st valvifer enables an pro- and retraction of the 1st valvulae. The 1st valvifer-genital membrane muscle (m1) potentially serves as a tensor muscle that stabilizes the 1st valvifers during their fast alternate movements by holding them in position laterally to the 2nd valvifers (Fig. 5a, b; Table 1). After a female wasp has found a suitable oviposition site, the contraction of the posterior 2nd valvifer-2nd valvula muscles (m3) causes the 2nd valvula and the interlocked 1st valvulae to flex anteriorly towards the active probing position . This flexing and the general employment of the terebra of V. canescens (as in many other ichneumonoid wasp taxa [62, 63]) might be assisted by the annulated and flexible 3rd valvulae and the generally improved manoeuvrability of the metasoma of the Apocrita . The 2nd valvifer is then rotated away from the dorsal surface of the metasoma concomitantly with the terebra. During the so-called cocking behaviour (sensu ) of V. canescens, the 2nd valvifer and the terebra flex simultaneously. In V. canescens, this characteristic behaviour is always performed prior to the actual oviposition and is assumed to correlate with the egg being passed down into the spindle-shaped cavity at the apex of the terebra in readiness for oviposition [32, 45]. The parasitoid then performs localized probing movements with the unsheathed terebra in the substrate (Additional file 1). Drilling movements of the terebra are not needed, since the hosts of V. canescens live in soft substrates. Once a suitable host is found, stabbing movements are conducted, whereby the terebra is quickly inserted into the host caterpillar [32, 65]. Thereby, alternate contractions of the dorsal T9-2nd valvifer muscles (m4a/b) and the ventral T9-2nd valvifer muscles (m5) indirectly execute the penetration movements of the 1st valvulae (which are documented in a braconid wasp ). In some species of Braconidae (the sister group of Ichneumonidae), these movements of the 1st valvulae are known to enable the wasps to actively steer their terebra to some extent: asymmetrical apex forces at the terebra in a viscid medium—caused by varying its asymmetrical tip by pro- or retracting one 1st valvula with respect to the other—result in a passive bending of the terebra , or restrictions in inter-element displacements (e.g. strongly swollen short regions pre-apically on the rhachises) cause the terebra to bend due to tensile and compressive forces . Throughout penetration, the relative position of the valvifers and consequently of the 1st valvulae might be monitored via the sensillar patches of the 2nd valvifers situated anteriorly to the intervalvifer articulations. In addition to penetrating the substrate, the longitudinal alternate movements of the 1st valvulae presumably serve to pass the egg along the terebra. This is facilitated by the egg canal microsculpture consisting of distally oriented scales (ctenidia and subctenidial setae) that push the egg towards the apex of the terebra and hold it in position by preventing backward movements [43, 46, 47]. Shah  suggests that the valvilli assist in moving the egg in the terminal part of the terebra by using hydrostatic pressure for a speedy delivery of the egg into the host. In V. canescens, the laying of an egg into the haemocoel of the host caterpillar takes only a fraction of a second [32, 45]. After oviposition and withdrawal of the terebra, the anterior 2nd valvifer-2nd valvula muscles (m2) extend the terebra back towards its resting position between the internal concave faces of the 3rd valvulae . Oviposition is commonly followed by cleaning behaviour during which the wasp especially grooms its antennae and terebra. The examination of the elements of the musculoskeletal ovipositor system of V. canescens and its underlying working mechanisms adds to our understanding of a key feature in the evolution of parasitoid hymenopterans, a feature that has impacted the evolutionary success of ichneumonid wasps (with more than 24,000 described  and more than 100,000 estimated species ) and parasitoid hymenopterans in general (with 115,000 described and 680,000 estimated species ). Whereas the basic organization of the ovipositor is remarkably uniform among the Hymenoptera , huge variations exist in its structure [9, 11, 12], which are associated with the employment of the terebra in the different taxa of parasitoid species (cf. [62, 63, 71, 72]). Further studies that combine thorough morphological analyses of a parasitoid’s musculoskeletal ovipositor system with investigations of its parasitoid–host interactions are needed in order to understand how morpho-physiological traits have influenced the evolution of behavioural, ecological and life history traits and vice versa in the megadiverse parasitoid Hymenoptera. The V. canescens specimens used in this study originated from the thelytokous lab colony of Biologische Beratung Ltd. (Berlin, Germany) from whom we also received larvae of the host Ephestia kuehniella Zeller, 1879 (Lepidoptera: Pyralidae). The wasps were kept in a glass box (20 · 30 · 20 cm) and reproduced after the addition of several pyralid larvae within a mealy substrate to the box every third week (Additional file 1). Three times a week, the imagos were fed with watered honey absorbed onto paper towels. The room was kept at a constant temperature of 24°C. The ovipositor was excised and dissected from the genital chamber of ethanol-fixed animals by using fine forceps, macerated in 10% aqueous potassium hydroxide (KOH) for 12–15 h at room temperature if necessary, cleaned in distilled water and dehydrated stepwise in ethanol (C2H6O). For light microscopy, specimens were mounted onto microscopic slides (76 mm · 26 mm, VWR International, Radnor, PA, USA), embedded in Euparal (Waldeck GmbH & Co. KG, Münster, Germany) and, after drying, investigated with a light microscope of the type Zeiss Axioplan (Carl Zeiss Microscopy GmbH, Jena, Germany) equipped wit a Nikon D7100 single-lens reflex digital camera (Nikon Corporation, Tokyo, Japan) and the software Helicon Remote version 3.6.2.w (Helicon Soft Ltd., Kharkiv, Ukraine) (for focus stacking Helicon Focus version 6.3.7 Pro; RRID:SCR_014462). For scanning electron microscopy (SEM), specimens were air-dried for at least one week in a desiccator. The samples were mounted with double-sided adhesive tape onto stubs, sputter-coated with 19 nm pure gold (Au) by using an Emitech K550X (Quorum Technologies Ltd., West Sussex, UK) and investigated with a scanning electron microscope of the type Zeiss EVO LS 10 (Carl Zeiss Microscopy GmbH, Jena, Germany) and the software SmartSEM version V05.04.05.00 (Carl Zeiss Microscopy GmbH, Jena, Germany). After completion of the microscopical studies, the remaining wasps were killed by freezing them at − 20°C. Two metasomas of ethanol-fixed female V. canescens were dehydrated stepwise in ethanol and critical-point-dried by using a Polaron 3100 (Quorum Technologies Ltd., West Sussex, UK) to minimize shrinking artefacts by water loss during the tomography procedure. The anterior ends of the metasomas were glued onto the tips of plastic pins, so that the ovipositor tip was oriented upright, and mounted onto the goniometer head of the sample stage for tomography. Synchrotron X-ray phase-contrast microtomography (SR-μCT)  was performed at the beamline ID19 at the European Synchrotron Radiation Facility (ESRF) (Grenoble, France) at 19 keV (wavelength 8 · 10− 11 m) and an effective detector pixel size of 0.68 μm with a corresponding field of view of 1.43 · 1.43 mm; 6000 projections were recorded over the 180 degree rotation. The detector-to-sample distance was 12 mm. As the structures of interest were larger than the field of view, four separate image stacks were acquired. Therefore, the sample was repositioned in between the imaging procedure, resulting in a certain overlap of two consecutive images. 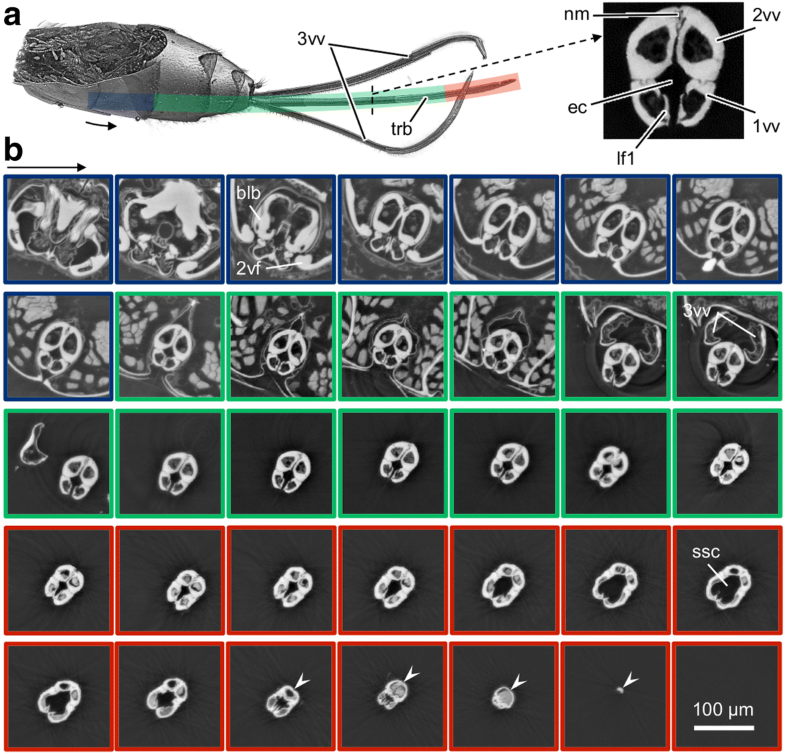 The 3D voxel datasets were reconstructed from the 2D radiographs by using the filtered back-projection algorithm [74, 75] developed for absorption contrast tomography. To obtain a high-resolution 3D image of the ovipositor and the inherent muscles, two consecutive images from the stack were geometrically aligned in an iterative 3D rigid registration procedure (Additional file 3). A stepwise strategy was applied for the registration. The two data sets were aligned according to the translation of the sample stage in between imaging. The images were then rigidly registered by using normalized mutual information of the grey value images as a similarity measure, with a line search algorithm for the optimization approach. A hierarchical strategy was applied to reduce the risk of finding local minima, starting at a coarse resampling of the datasets and proceeding to finer resolutions. Finally, an affine transformation by using a Lanczos interpolation (cf. ) was performed that interpolated both images into the same coordinate system. As a result, all four images were matched in a common coordinate system. An edge-preserving smoothing filter was applied for the segmentation of the individual structures. Segmentation was based on local differences in densities, as chitinous structures have higher densities than muscles. Therefore, grey value images were binarized by using a dual threshold approach that allowed the extraction and separation of regions with different densities. The obtained two masks of muscles and denser structures were further processed to differentiate them into their various morphological components. Therefore, a semi-automatic extraction of biological structural features was applied by using geometric information. First, small islands were removed with an opening filter and, subsequently, the connected components were automatically labelled. Second, the resulting chitinous structures were manually split at the connection points between the female T9 and the valvifers and at the olistheter mechanism of the terebra, as these fine structures could not be segmented automatically because of the limited resolution of the images. For each muscle bundle, insertion regions (apodemes) were identified on the cuticular elements at both muscle ends, with the whole muscle between the apodemes being determined in a semi-automated interpolation process. This resulted in individual labels for the six muscles involved in ovipositor actuation mechanics. A Gaussian filter was applied for smoothing the 3D masks of the individual chitinous and muscular structures and 3D morphological volumetric models of the biological structures were generated. Image processing was performed by using the software Amira version 6.0 (FEI, Hillsboro, OR, USA; RRID:SCR_014305) and the custom MATLAB scripts version R2016a (The MathWorks, Inc., Natick, MA, USA; RRID:SCR_001622). Muscle volume, mean length and mean cross section area were determined from the 3D data sets. The obtained muscle volume values potentially are lower than in living animals due to shrinking artefacts. The total muscle length and the major direction of the muscle force was determined as the distance between the centre points of the attachments of the muscles and the direction of the line in between, respectively. The exact locations of the muscles’ origins and insertions were verified with light microscopy. The mean cross section area (CSA) was determined as the muscle volume / muscle length. However, the orientation of the single muscle fibre might deviate from the direction of the main muscle force (cf. ), which potentially results in an underestimation of the estimated CSA of an individual muscle and thus its maximum muscle force but also an overestimation of its maximum contraction distance. The anatomical inlevers were measured from the 3D data set and the joint angles were determined. The anatomical lever was defined as the length of the line between the joint axis and the point where the muscle force is applied, i.e. the tendon attachment point. The effective lever arm, which is pivotal for the efficiency of the force transmission, is defined as the perpendicular distance between the projection of the line of action of the tendon attachment point and the joint axis. Benjamin Eggs and Annette I. Birkhold contributed equally to this work. The authors thank the following colleagues for their help: Alexander Rack for assistance with the beamline ID19 at ESRF, Monika Meinert and Michael Csader with SEM, Paavo Bergmann, Manfred Drack and Stefan Fischer for valuable tips and inspiring discussions, Helen A. Eggenberger and Theresa Jones for improvements and linguistic corrections of the manuscript, and two referees for their useful comments. This work was funded by the German Research Foundation (DFG) as part of the Transregional Collaborative Research Centre (SFB-TRR) 141 ‘Biological design and integrative structures’ (project A03 ‘Inspired by plants and animals: actively actuated rod-shaped structures exhibiting adaptive stiffness and joint-free kinematics’). The experiment (LS-2342) at ESRF was funded by the EU. The article processing charge was covered by the DFG and the Open Access Publishing Fund of the University of Tübingen. All data supporting the conclusions of this article are included within the article and its additional files. The analysed raw datasets are available from the corresponding author on reasonable request. BE, AIB, OR and OB prepared the study design. OB attained the SR-μCT data. AIB performed the analysis of the SR-μCT data. BE performed the LM and SEM studies, interpreted the data and wrote the manuscript. AIB, OR and OB discussed the results and revised the manuscript. All authors read and approved the final manuscript. No approval of research ethics committees was required to accomplish the goals of this study because experimental work was conducted with an unregulated invertebrate species. The area of the 1st valvifer-1st valvula complex that is proximal to the aulax, bears the 9th tergal condyle of the 1st valvifer and the 2nd valviferal condyle of the 1st valvifer and is connected to the genital membrane by muscle. The anatomical cluster that is composed of the sclerites that articulates with the 9th abdominal tergite and the 2nd valvifer. The ovipositor muscle that arises from the posterior part of the 1st valvifer and inserts anteriorly on the genital membrane anterior to the T9-genital membrane muscle. The area of the 1st valvifer-1st valvula complex that is delimited distally by the proximal margin of the aulax. The area of the 2nd valvifer-2nd valvula-3rd valvula complex that is proximal to the basal articulation and to the processus musculares and articulates with the female T9. The area that is connected to the 9th tergite and the 1st valvifer via conjunctiva, is articulated to the 1st tergite, and bears the aulax. The area of the 2nd valvifer-2nd valvula-3rd valvula complex that is proximal to the basal articulation. The ovipositor muscle that arises anteriorly from the dorsal flange of the 2nd valvifer and inserts anteriorly on the dorsal part of the genital membrane. The condyle that is located on the 1st valvifer and articulates with the 1st valviferal fossa of the 2nd valvifer. The area of the 2nd valvifer-2nd valvula-3rd valvula complex that is distal to the basal articulation and to the processus musculares and is limited medially by the median body axis. The area of the 2nd valvifer-3rd valvula complex that is posterior to the distal vertical conjunctiva of the 2nd valvifer-3rd valvula complex. The condyle that is located on the 1st valvifer and articulates with the 1st valviferal fossa of T9. The carina that is transverse and extends across the lateral wall of the terebra. The ovipositor muscle that arises from the anterodorsal part of the 2nd valvifer and inserts subapically on the processus articularis. The corner on the 1st valvifer that marks the posterior end of the 1st valvula. The area of the 2nd valvifer which is anterior to the anatomical line that is the shortest distance from the 1st valviferal fossa of the 2nd valvifer and the ventral margin of the 2nd valvifer. The flange that extends anteriorly on the 1st valvifer and overlaps with the posterior margin of the anterior area of the 2nd valvifer. The flange that extends along the anterolateral margin of female T9. The ridge that extends along the anterior margin of female T9 and receives the site of origin of the ventral and the dorsal T9-2nd valvifer muscles. The area of the dorsal flange of the 2nd valvifer that is anterior to the site of origin of the basal line. The area that is located on the sclerite and that makes movable direct contact with another sclerite. The impression that is on the 1st valvifer-1st valvula complex accommodates the rhachis. The articulation that is part of the 2nd valvifer-2nd valvula-3rd valvula complex and adjacent to the rhachis. The line on the 2nd valvifer that extends between the pars articularis and the dorsal flange of 2nd valvifer. The anterior area of the dorsal valve [composite structure of the fused 2nd valvulae] that is bulbous. The process that is elongate and external. The articular surface that is convex and is inserted into the fossa of an adjacent sclerite. The area of the cuticle that is weakly sclerotized, with thin exocuticle. The apodeme on the anterior margin of female T9. The ventral T9-2nd valvifer muscle attaches partly on the apodeme. The notch that is distal on the dorsal valve [composite structure of the fused 2nd valvulae]. The conjunctiva that traverses the 2nd valvifer-3rd valvula complex and is located distal to the median bridge of the 2nd valvifers. The flange that extends on the dorsal margin of the 2nd valvifer. Part of the ventral T9-2nd valvifer muscle attaches to the flange. The projection that is located on the 2nd valvifer and corresponds to the proximal end of the rhachis. The region that extends along the dorsal margin of the 1st valvula and bears the aulax. The area that extends along the dorsal margin of the 2nd valvula, bears the processus articularis anteriorly and the processus musculares on the antero-dorsal region and articulates with the 2nd valvifer via the basal articulation. The sclerite of the 1st valvifer that is located dorsally of the transvalviferal conjunctiva. The ovipositor muscle that arises along the posterodorsal part of the anterior margin of female T9 and inserts on the anterior section of the dorsal flanges of the 2nd valvifer. The anatomical space that is between the left and right olistheters. The tergite that is articulated with the 1st valvifer and is connected to the 2nd valvifer via muscles. The projection that is lamella-like and is located on a rim, carina, apodeme or edge. The articular surface that is concave and accommodates the condyle of another sclerite. The sclerite that is proximal to the 2nd valvifer and receives the site of origin of the posterior 2nd valvifer-2nd valvula muscle. The conjunctiva that connects the ventral margins of the 2nd valvifers arching above the 2nd valvula. The anatomical system that forms the covering layer of the animal, ectodermal in origin and composed of epidermal cells producing the cuticle. The ridge that extends along the posterior margin of the 1st valvifer between the intervalvifer and tergovalvifer articulations. The articulation between the 1st valvifer and 2nd valvifer. The articulation between the dorsal sclerite of the 1st valvifer and the ventral sclerite of the 1st valvifer. The muscle arises from the posteroventral parts of the female T9 and inserts on the median bridge. The area that connects posterodorsally the 2nd valvifers and is the site of attachment for the posterior T9-2nd valvifer muscle. The conjunctiva that extends medially along the 1st valvula. The conjunctiva of abdominal tergum 9 that has median and longitudinal. The conjunctiva that connects the medial margins of the 2nd valvulae. The anatomical cluster that is composed of the rhachis of the 2nd valvula and the aulax of the 1st valvula. The anatomical cluster that is composed of the 1st valvulae, 2nd valvulae, 3rd valvulae, 1st valvifers, 2nd valvifers and female T9. The anatomical cluster that is composed of the ovipositor, abdominal terga 8–10, abdominal sternum 7 and muscles connecting them. The abdominal muscle that inserts on the ovipositor. The articular surface that is situated anteriorly on the ventral margin of the 2nd valvifer and forms the lateral part of the basal articulation. The ovipositor muscle that arises posteroventrally from the 2nd valvifer and inserts on the processus musculares of the 2nd valvula. The area of the 2nd valvifer that is posterior to the anatomical line that is the shortest distance from the valviferal fossa of the 2nd valvifer to the ventral margin of the 2nd valvifer. The margin of the 1st valvifer that is posterior and extends between the intervalvifer articulation and the anterior angle of the 1st valvifer. The area of the dorsal flange of the 2nd valvifer that is posterior to the site of origin of the basal line. The ovipositor muscle that arises medially from the posterodorsal part of female T9 and inserts on the median bridge of the 2nd valvifers. The corner of the 1st valvifer that is adjacent to the intervalvifer articulation. The area on the sclerite that is raised. The process that extends laterally from the proximal part of the 2nd valvula and forms the median part of the basal articulation, and corresponds to the site of attachment for the anterior 2nd valvifer-2nd valvula muscle. The apodeme that extends dorsally from the proximal part of the 2nd valvula to the genital membrane and receives the site of attachment of the posterior 2nd valvifer-2nd valvula muscle. The ridge that extends along the ventral surface of the 2nd valvula that is partially enclosed by the aulax. The apodeme that is elongate. The process that is located along the ventral margin of the 1st valvula or the dorsal margin of the 2nd valvula. The area of the cuticle that is strongly sclerotized, with thick exocuticle and is surrounded by conjunctivae. The patch that is composed of placoid sensilla adjacent to the intervalvifer articulation. The area that is located on the integument and is ventral of the ventral diaphragm. The ovipositor muscle that arises from the cordate apodeme and inserts dorsally on the proximal part of the genital membrane and on the opposite cordate apodeme. The portion of tissue that is fibrous, strong, composed of tendon cells and connects the muscle to the integument. The anatomical cluster that is composed of the 1st and 2nd valulae. The sclerite that is located on the tergum. The articulation that is located between the female T9 and the 1st valvifer and is composed of the 9th tergal condyle of the 1st valvifer and the 1st valviferal fossa of the 9th tergite. The area that is located on the integument and is dorsal of the ventral diaphragm. The conjunctiva that transverses the 1st valvifer and separates the dorsal and ventral sclerites of the 1st valvifer. The sclerite that articulates on the 1st valvula and projects into the egg/poison canal. The gland reservoir that is between the 2nd valvifers. The area that extends external to the dorsal ramus of the 1st valvula. The area of the 2nd valvifer-2nd valvula-3rd valvula complex that bears the rhachis. The sclerite of the 1st valvifer that is ventral to the transvalviferal conjunctiva. The ovipositor muscle that arises from the lateral region of female T9 and inserts along the posterior part of the dorsal flange of the 2nd valvifer. Hymenoptera Anatomy Consortium. Hymenoptera Anatomy Ontology. 2018. http://glossary.hymao.org. Accessed 28 May 2018. Yu DS, van Achterberg K, Horstmann K. World Ichneumonoidea 2004. Taxonomy, biology, morphology and distribution. 2004. http://www.taxapad.com. Accessed 22 Jan 2018.